It's Antique Week where EVERYTHING Antique and Beautiful has come to be bought, sold, traded and adored! We look forward to this market every Spring. The green Texas Highways are lined with beautiful Texas blue bonnets, pink evening primrose, and spotted bee balm. Thousands of dealers from around the country and world have congregated near Roundtop this week. Here are some of our favorites! Lexi and I had a little extra help this year from my delightful grandson, Hudson. This antique dentist cabinet from Paris, TN will be in Objet Trouvé at The Barn, Bigfork, MT this summer! Imagine what an amazing electrified jewelry cabinet this will be! Send us your wist list. We take requests. We found this work bench for a rustic ranch house in WY for VeraIconica Architecture! Antique book and rustic pots are a such a beautiful way to decorate a bookcase. We'll have both books and french terra cotta pots at Objet Trouvé. It is so inspiring to see so much talent in one place! I'll be back with part two of our fun TX shopping adventure. 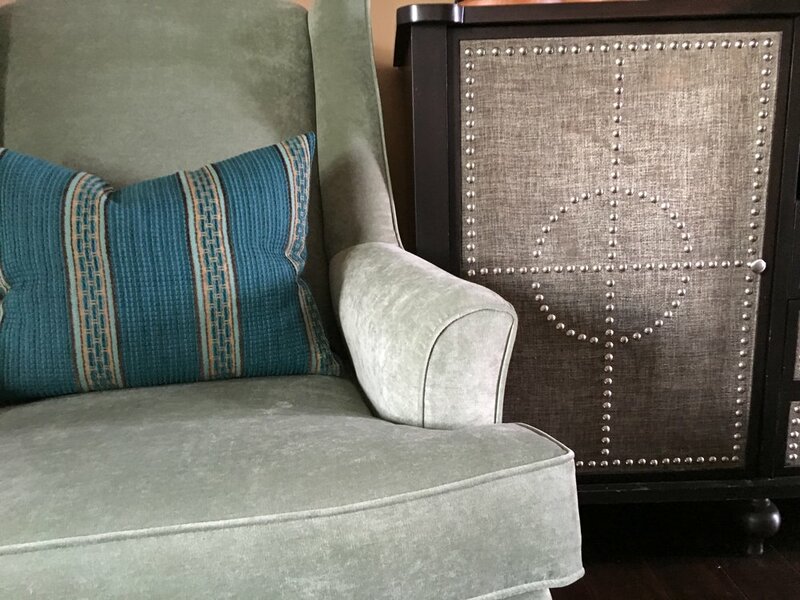 We have a huge number or requests for options and ideas to cover a TV, or minimize its main focus in a room. For many its challenging to spend a great deal of effort to make your living room, or bedroom a beautiful, functional space, only to have the center focus ruined by a large black TV. Yes, its true... some of us dislike the way a TV looks in a room, but let's face it, they are a staple many of us simply won't do without. There are several design options to cover the TV. Yet for every client who loves a TV cover option; we have an equal amount of clients who don't want to cover their TV only to uncover it to when they flip it on. We have found the perfect resolutions for both! 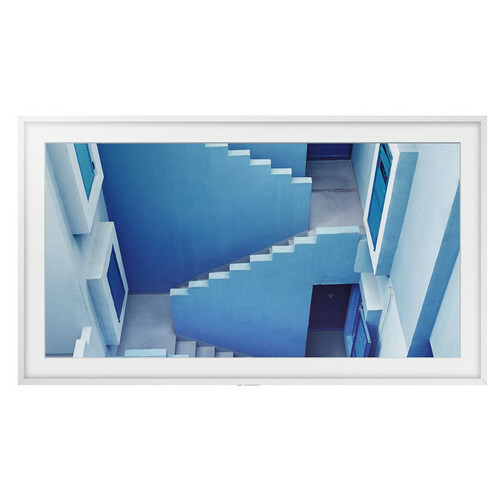 Introducing Samsung's new Customizable Frame for the Frame TV! Select from Beige and walnut wood, or white metal frames. Available in 55" and 65". Et Voila. Design dilema solved. There are few things in this world more overwhelming than moving into your very first property. With so many different decisions to make, and so many choices available to you, there's a good chance that you'll end up sitting on your boxes for a few weeks, unable to decide which furniture is right for your new living room. With so much confusion around how to design the perfect interior space, it's no surprise that so many people turn to professional interior designers for help. If you're just starting fresh with a brand-new property, here are a few things you should consider before you start your decorating adventure. It's surprising how many people approach an interior design expert with absolutely no idea of what decorating styles they like best. The easiest way to give yourself inspiration when it comes to which colors you should use, what kind of furniture is right for you, or even the style of accessory that you prefer, is to look online. There are plenty of websites out there that showcase pictures of other homes that you can use as a muse for your own interior design choices. You can save your favorite pictures into an idea book which you can then take to your interior designer when you're working with them to create your perfect space. While it would be great to simply buy what you want without worrying about the repercussions, most people will have at least a basic budget that they need to stick to with their interior design choices. Deciding how much you must spend early on is a great way to make sure that you don't break the bank. If you're moving to a new city, then you'll need to consider the expenses associated with living somewhere new before you start calculating. Do your research and find out how much the basic things cost in your new home location, like gas, electricity, and insurance. Some of your interior design choices will simply be small accessories that you can change out over time as your preferences evolve. Other things, like your bed, your sofa, and similar "large" furniture solutions are more likely to stay with you for a couple of years. When you're exploring the marketplace, make sure that you pick items that are more "timeless" than trendy. This will help to ensure that you don't get sick of your big purchases too quickly. It's also a good idea to measure all your spaces before you go shopping so you know exactly what kind of dimensions you're trying to fill. Keep in mind that very large pieces of furniture can cause smaller rooms to appear compact and overwhelmed. Still Concerned? Why Not Hire A Pro? Finally, if you’ve just moved and you're unsure how to make your new home into the perfect space for you and your family, then the easiest thing you can do is hire a professional to work with you on your interior design decisions. These people are experts in their field, and they can help you with everything from complete room overhauls, to minimal consultations depending on what you need. This shower is the star of the show in this sparkling new bathroom! 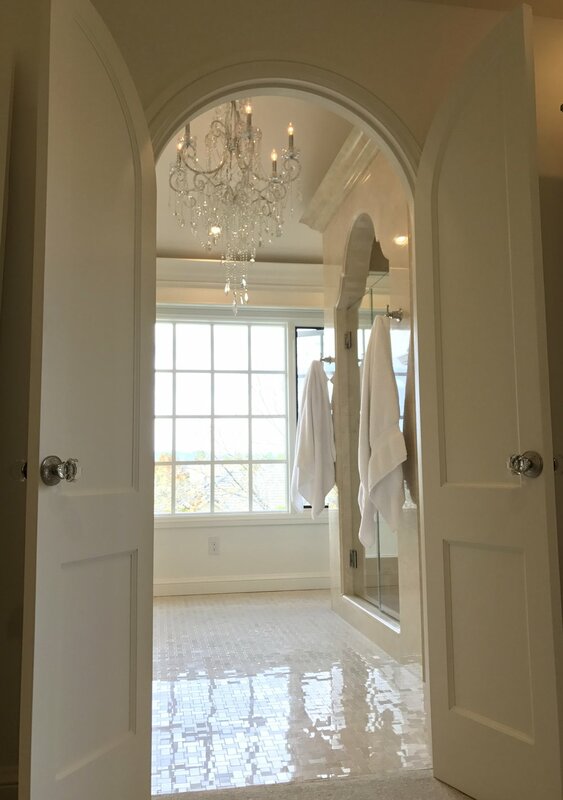 Mirrored closet doors, sparkling basket weave marble tile & glass drawer pulls lead your eye up to the top of the arched shower opening and gorgeous chandelier. Below is a before image of this shower area and you can see we removed a window on this wall to center the shower. Shoe storage cabinets were added on each side of it. We were concerned about losing light from the window so we enlarged windows on the adjacent wall and mirrored the cabinets making the room even brighter than before. This rounded cabinet used to be a drywall corner which blocked the light from the windows. By removing this rounded wall cabinet storage, countertop space and light were all gained. In the before below you can see that a linen closet was also replaced with cabinetry opening up the space. Before photo of linen closet replaced by open shelves and drawers and drywall corner replaced by rounded cabinet and countertop. Above is a detail of jeweled drawer pulls on a jewelry storage drawers. Mirrored sliding doors on the closet have detailed European pulls. The hardware and crystal handled faucets and controls are the jewelry of the room. Double doors were installed between the master bedroom and bathroom for noise control and privacy. The bathroom ceilings were raised and two stunning Chandi chandeliers fill the space with light. The sparkling marble floor and chandeliers beckon you into this sanctuary. The above countertop cabinet is deeper than it appears. It is recessed behind the mirror. Inside is ample storage with electrical plugs for appliances that pull out. 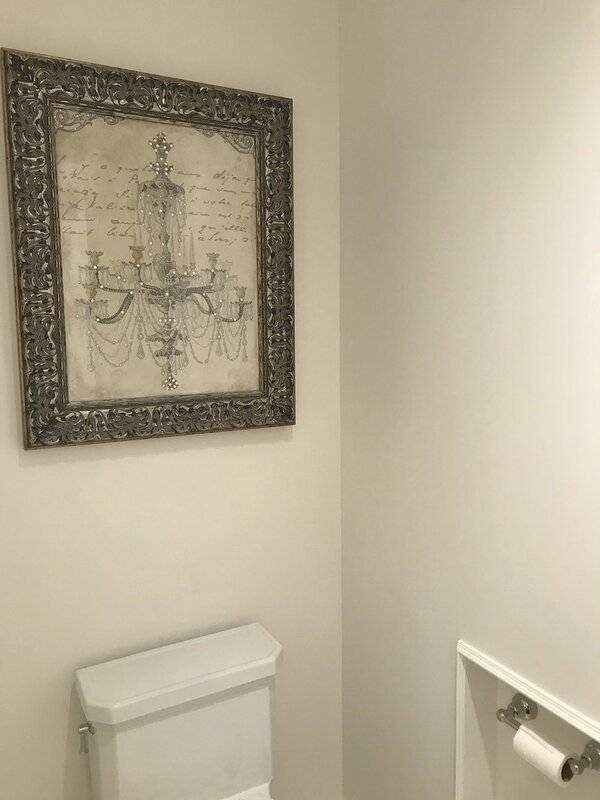 This artwork above the toilet is not just decorative. It opens up to reveal storage for toiletries! Creating a dream home is exciting, but translating a vision into reality takes effort – and that is sometimes a dispiriting process. I have twice owned homes I believed were within my capacity to stylishly curate, sans professional expertise, and twice I was wrong. My first effort was a trendy mid-century perched in the hills of Portland, and my second a darling log cabin at the edge of a lake. Though poles apart on the genre wheel, I had carefully done my research to be sure I was acquiring homes with the architectural significance I desired as the backdrop of my life. And home shopping was great fun! I relished wandering the rooms and grounds of other peoples’ homes, contemplating their design choices and savoring their style. At turns, I would admire the chic or admonish the errors, gathering inspiration and visualizing my life evolving in a new space. Tragically, the fun stopped right there. Move in day arrived and it was all too clear: the imagined felicity of decorating my new home was colliding with the avalanche of evidence that I had no idea what I was doing. After a great many sleepless nights, I had to accept that I was out of my depth – that creating truly beautiful interiors requires real skill. Overwhelmed, I formulated an ethos to guide my style-weary soul. When I bought my Portland home, I was utterly confident – brimming with zeal. I wanted a certain look that I was sure I could accomplish with what I already owned and a little imagination, so I took to the graph paper and sketched a plan for each room. When the furniture arrived I directed according to my space plan, but the results lacked panache. I had failed to account for the probability that furniture and accessories bought for one home would simply refuse to live in another. (How can a pillow defy you? But it does!) The contours were too disparate. It was like trying to fit a square peg in a round hole. Oh, did I try. I spent weeks styling different arrangements. This, of course, led to nightly bottles of wine while I destroyed perfectly pristine sheet rock moving art and smacking things around . . . hanging it higher, then lower, then behind the sofa . . . no wait, what about over the bed . . . I was out of control. After a month, crestfallen and with badly damaged walls, I had to admit: I cannot sort this out. I need a designer. But the cost, my husband fumed! I had to talk him off the ledge; paying a professional is a strategic expense that insures against outright disaster. The decorator’s wisdom was evident at the first meeting when she told me: do not buy anything “off plan.” This, it turns out, is kind of like being on a diet, which is basically wretched, but also a kind of relief. It became her task to source the right pieces. In my design hysteria, I had been scouring magazines, books and blogs searching for inspiration, and this had led to erratic acquisitions, anything I fancied – mirrors, tchotchke and way too many period lamps. In the quest to decorate my home, I was behaving like a food restricted maniac, except that instead of pinching cookies for my coffee, I was bingeing at Design Within Reach. My decorator put an end to this and mercifully plugged the money drain. She was able to cultivate ground rules for my shopaholic creativity and formulate a plan. Together we decided what we could re-purpose and what needed to go. The net result: savings. Designers add a layer of cost, but the money saved not buying things you don’t love and can’t use allows you to hire a partner who can bring the surety of a fitting outcome. Acknowledging what could be accomplished with competent help, I shifted attention to my Christmas cabin nestled in the woods of Montana. My log home had been particularly difficult to style. I had owned it for several years and had gotten quite used to its existing state, largely unchanged since it was built. With storybook charm, I grew attached to all things red and plaid. The more woodsy a vignette appeared, the more I felt it must have grown into the floorboards and hence “could not be altered.” Again, I was wrong! I began with something I felt I could manage and had the old pine floors refinished. They turned out so beautifully that for a time, I didn’t even want furniture to come back inside. I just plunked two folding chairs down in front of the TV and opened a bottle. Rustic Minimalism seemed like a thing! But the furniture piled on the porch didn’t fit the woodland vibe and was also in danger of being eaten by raccoons. Decisions had to be made. Wiser now, I knew I needed guidance and called my neighbor, Jennifer Wright, of Alexandra Lauren Interiors. An accomplished local designer, and kindred cabin dweller, she understands the power of plaid. Repurposed Rustic emerged as she eliminated clutter that stole the show from the glimmering lake outside the windows, expanding interior vistas and illuminating the view. One piece at a time, we brought the furniture back. Taking cues from the habits of my lifestyle, she began making suggestions for altered layouts, grabbing pieces from other rooms and swapping out dated bits that were not adding any spice. Items I did not think could live together began to sing in harmony, and I began to trust her instincts as I refined my own. This is collaboration that works. A designer need not supplant your own ideas, but she can edit in a way that a homeowner often cannot. She knows when the tableau is complete. When we fall in love with the beauty of our space, it can be difficult to say “no.” But with everything beloved, nothing stands out. Design Rule number one must be: If it looks better with one less thing, you have to get rid of that thing. Style-Ninjas definitely police our indulgent impulses! Still, my cabin-cousin was open to suggestions because she understood that repurposing older things adds joy for a homeowner and layers of emotional texture. When the cedar planks came off my weathered dock, I knew those old boards had value and I wanted to use them as wainscoting for a bathroom remodel. My idea and my designer’s know-how resulted in a collaboration that produced a showcase master bathroom and the reuse of perfectly good trimmed up wood. Eco-chic is on trend! The vanity and tub surround are re-purposed from old cedar dock wood. Do not fear: using a decorator doesn’t mean you don’t have good taste or a sense of style! You do! But the discernment and distance a designer can bring will save you hours of agony – and piles of dollars. With my three guidelines in mind, my home smartening projects provided an outcome I loved, at a cost I could manage, and threaded the joy of creating a sacred space – a life to cherish – in a home that reflects my heart. 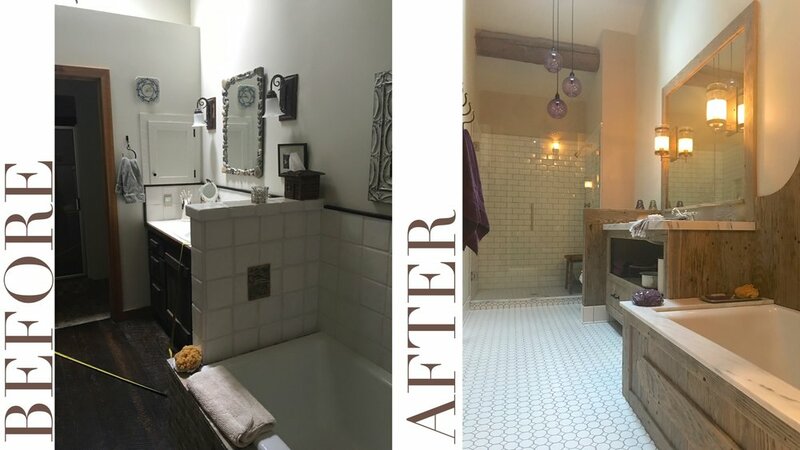 tags / eco chic, Reclaimed Wood, Bathroom Design, Interior Designer, Jackson Tennes, Bigfork Montana, Kalispell Interior Desitner, Bathtub, Tile, Bathroom, Before and After, timorousbeasties, JenniferLenzWrightInteriors, bath remodels, Timorous Beasties, Bath Remodel, Objet Trouve Bigfork, Lighting, Wiese Tile and Granite, Chris Pemberton, Jennifer Lenz Wright Interiors, Echo Lake, Bigfork MT, Flathead Valley Montana, Ed Gillenwater Art, Cisco Lighting, Frame of Reference, Bath Accessories, Curated Kravet, Why to hire an interior designer, Why pay for a designer, Should I hire an interior designer?, To hire an interior designer or not to hire an interior designer? Interior designer and event stylist Alexandra Lauren created a festive fall scene amid the corn maze at Donnell Century Farms in Jackson, Tennessee. This magical tablescape features décor and china in muted green, deep purple and blue to complement light orange and white pumpkins. Inspired by the people for whom she designs, Lauren says her creative philosophy is to amplify each client’s personal style. This table is very much a representation of Lauren’s personal rustic and romantic style, and reflects the designer’s belief that fall is the perfect time to gather friends and loved ones around a table and give thanks. “I went pumpkin crazy! I used fantasy pumpkins (a beautiful muted orange), white pumpkins, pastel pumpkins and mini white pumpkins on each place setting. I love the gestures in the stems; this is always what I pay attention to at the patch,” Lauren says. The decor also includes fairy tale pumpkins in a romantic muted orange. The live garland on the table is a mixture of eucalyptus, sweet dumpling mini pumpkins and scabiosa pods placed throughout. For the centerpiece, the designer chose a grapevine basket filled with antique deep purple and burgundy hydrangeas, and a pumpkin topiary. The French blue ruffled seat cover is from Alexandra Lauren Design Linens, available at www.AlexandraLauren.com. Lauren’s passion for interior design has been lifelong. Her mother ran her own interior business out of her home, and Lauren always loved playing with swatches and colors with her in her office. Lauren’s design career started in Hong Kong in 2003 where she was designing dinnerware for Target, The Great Indoors and many other mid-tier retailers and department stores for export to North America, Europe and Australia. This is where her passion for setting a table began. Lauren started doing interior design when she opened her studio in Hong Kong in 2008. One of her first projects was redecorating a factory showroom in Shanghai, China. From there Lauren moved into residential, restaurant and event design. This is an exciting day for us! It is the beginning of a dream going back to Jennifer and Anne's college days, a shop bringing old world elegance with a rustic and refined styling to the Bigfork area. We named our shop ‘Objet Trouve’ as it means the art of collecting and curating found objects…and this is our vision… to inspire you to decorate with objects that simply make you happy. We have filled our shop with home accessories and furniture that we both love…including an exquisite one-of-a-kind antique French farm house table with a zinc top, a pine merchant cabinet that will be the star of any room, a collection of enchanting mirrors and a divine pair of French mirrored windows with original paint and hardware! For our grand opening we have a few spring & summer tips for decorating that we would like to share! 5. 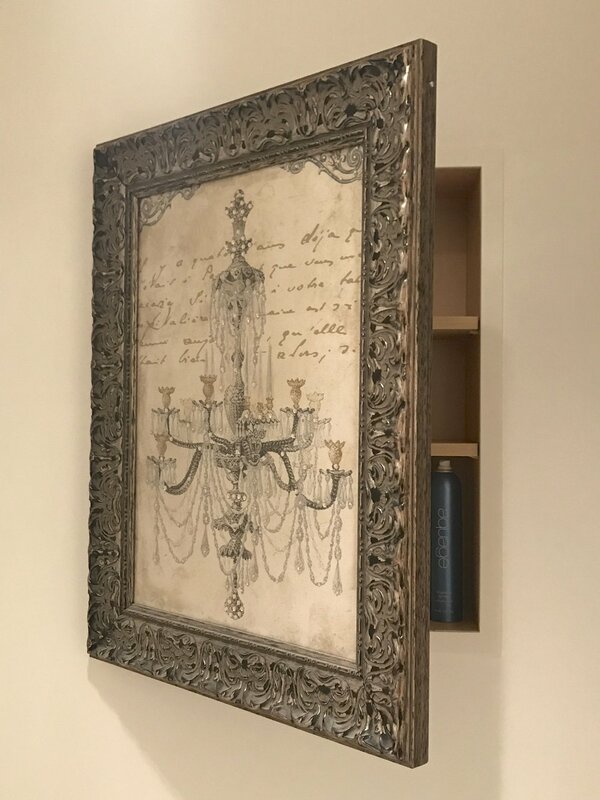 Use an architectural piece such as our antique white corbels to create a shelf or table to display your unique objects! on June 30, 2017 from 5-7 p.m.
We are excited for you to visit our shop and pick up a treasure or two!! 1. 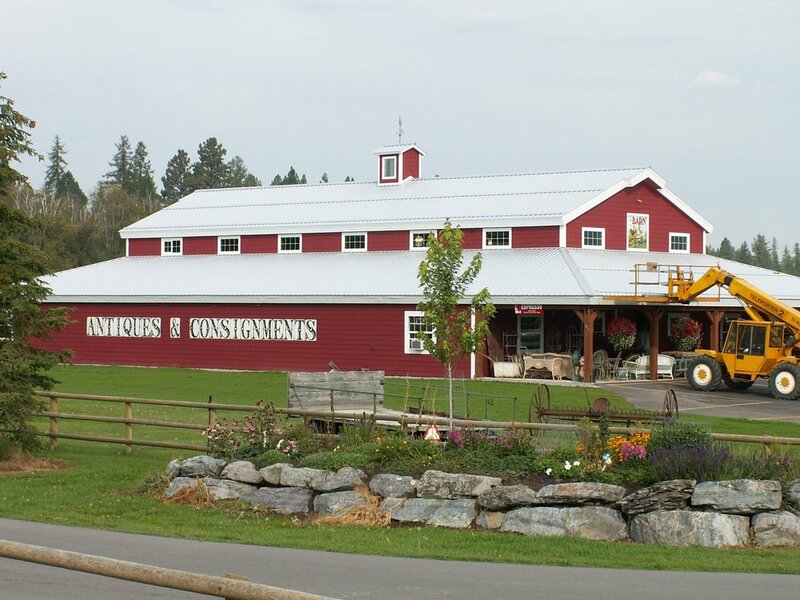 The Barn has fabulous new and antique furniture in the Bigfork Area! The store is filled with a wonderful selection of new & antique furniture pieces, household items, collectibles, artwork and so much more. The vendors offer a wide variety of western, rustic, vintage and shabby chic décor with an abundant mix of old and new. 2. Objet Trouve is the newest addition to The Barn! 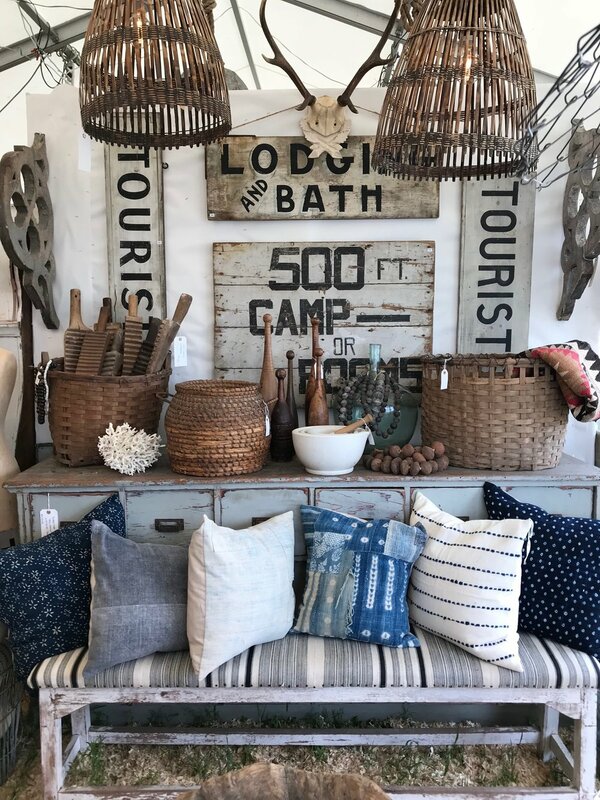 Our shop is the newest member of The Barn family and we are so excited to have you see our home accessories that is a mix of new, vintage and antique home & garden accessories. We have curated our shop to have the perfect mix of rustic and refined items. Change it up this year with an outdoor urn that says I am ready for ‘spring.’ We have small and large planter urns filled to the brim with moss and flowers that will provide that finishing touch to your front door, porch or patio. We have the most charming one-of-a-kind items in our shop. Change it up with a vintage floor or hanging chandelier that will make a statement in your home. Who says a chandelier can’t hang in your kitchen over an island or in your bathroom? Our chandeliers can provide that unexpected elegance and romance to any room. 5. Build a room around fabulous pieces! Bring that farmhouse style to your dining setting with a rustic antique French table with a hammered zinc top with turned legs. This table will look fabulous dining al fresco under twinkling lights or in your Montana kitchen paired with our French balance scales. Our pine merchant cabinet would be the perfect addition to your living room, dining room or library with its sixteen open spaces for collectibles or china with two level shelves hidden by sliding doors. This piece will bring a new but timeless feel to your space that is both practical and stylish. BONUS: The Barn makes great lattes! April Shower and Beautiful Flowers! Lexi and Preston are expecting their first baby! It's a Boy! Jennifer and Great Grandma Lois hosted a beautiful shower at The Hermosa Inn celebrating with lovely friends and family! Lexi and Baby Powell at 6 months! Beautiful Great-Grandma Lois arriving for the luncheon. Favors and flowers adorn the library tables, ready for our guests. Thank you Ariela Schreibeis for taking photos for us on this fun day. Aunt Danielle and sweet Christina who is due just a month before! Sisters make celebrations extra special. 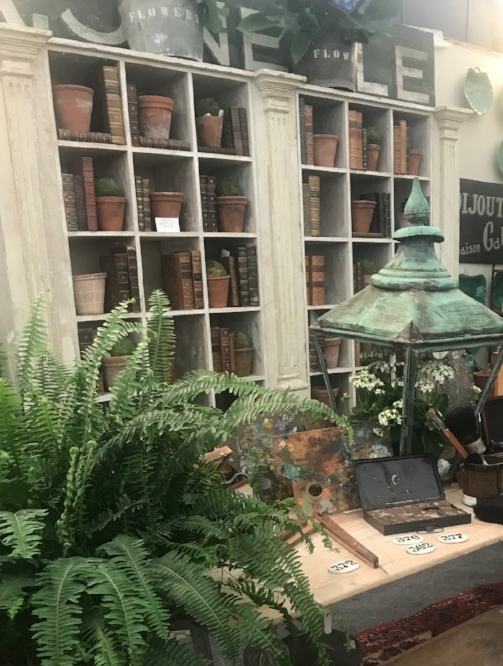 Meet Jennifer and Anne, purveyors of Objet Trouvé, a new shop inspired by antiques and classic design from Alexandra Lauren. They met the 1st day in college at the University of Wyoming and have shared the love of all things French and fabulous ever since. Jennifer is an interior designer working in MT, AZ, CA, WY, CO, UT, TN and Hong Kong. Anne currently designs software for a healthcare company. Together they bring a unique perspective to the art of decorating and home styling combining Jennifer’s eye for craftsmanship and attention to detail with Anne’s love of the unstudied and collected look. Join Jennifer and Anne as they search for home accents and accessories for the May 2017 opening of their shop at The Barn in Bigfork, Montana. Follow their adventures and treasure hunts on Facebook, Objet Trouve byAlexandra Lauren, and Instagram, ObjetTrouveBigfork, in their quest to bring that rustic and refined edge to your home. The most simple winter transition for a home is to swap out throw pillows and blankets to warm up a room. I love going with neutral furnishings that allow me to flex the throw cushions with the season. A simple bouquet of greenery, and fresh cuttings here and there cozy up corners instantly. Make your own place names for your holiday table! Simply tape 3 candy cane's together et voila! Our Alexandra Lauren Ruffled Christmas stockings make the perfect addition to your mantle! Available on our website under "Shop Our favorite things." Our lined linen stockings are available in four colors including: Parchment (as shown), French Blue, Soft Green and Christmas Rose. All of our linens are proudly made in Tennessee! Seasonal accent pillows and a throw blanket switched out on this neutral chair instantly warmed up my kitchen nook. We replaced our summer plant with some Christmas greenery, in our Voss tub by the back door. I love the antique patina on this piece my husband purchased for me when we were antiquing. I set my greenery in my boot temporarily as I was decorating and loved it enough to leave it :). A huge thank you to Our Jackson Home for publishing our story! At Alexandra Lauren Design we take pride in making every event entirely unique to the individuals being celebrated. 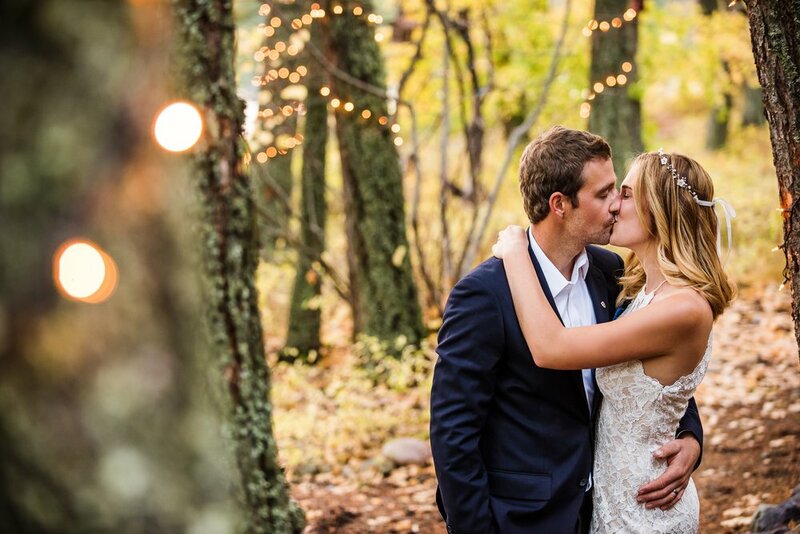 As a Montana girl at heart, Alexandra was humbled and thrilled when she and Jennifer were hired to create this ethereal forest and fairy light filled setting for Nic and Hillary in Bigfork, Montana. The beautiful trees and lakes in Montana speak for themselves. Wrapping the trees with twinkle lights accentuated this dreamlike backyard. All photography was done by one of our all time favorite Montana photographers, Marianne Wiest. Montana enraptures you with year round beauty. As a result, designing in Montana is all about bringing the beautiful outdoors in. In the Fall, every tree comes alive with light and color casting a romantic display. 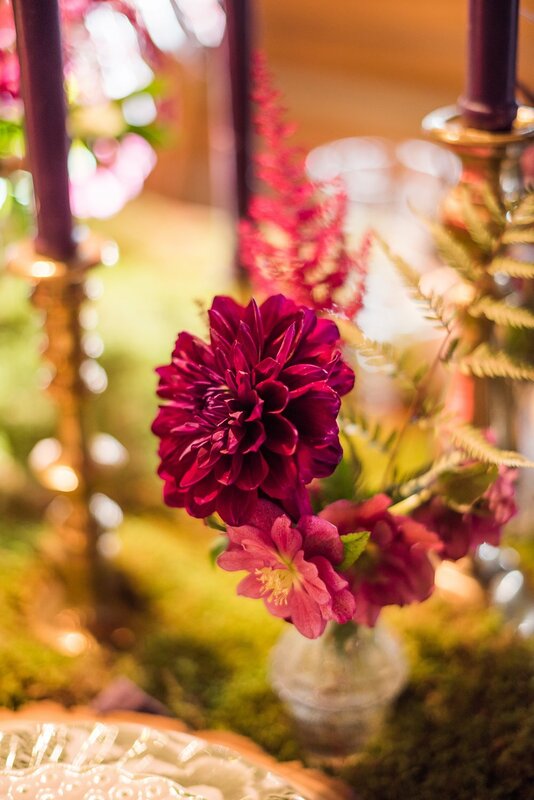 We used natures palette and accentuated a deep aubergine for our floral display. We brought the majestic forest indoors using a table covering with sheet moss. Cut logs served as chargers for the plates. A mixture of antique dinnerware created an eclectic and rustic tone for this cozy fireside cabin dinner party in honor of the Bride and Groom! Kimbo's Wish is an organization dedicated to granting a wish to children and their families faced with a terminal illness. When Founder, Christen Hankins contacted me to give Huntington, TN resident, Miss Morgan Fuller her wish of a dream bedroom I could not resist the opportunity. I chose to work with Morgan, because while faced with her own adversity she selflessly raised $8,000 for other children through the Make A Wish Foundation to help other children faced with her own condition achieve their dreams. Morgan's dream was to have a bedroom that did not remind her of a hospital room. Morgan requested grey walls, black trim and pink doors. Mike Measley of M & M Construction kindly volunteered his team to repaint Morgans bedroom for me. During my initial consultation with her she expressed her dream to go to cosmetology school, and her need for space to do her artwork. Morgan had several pieces of furniture including a desk that belonged to her father when he was a child, and a dresser drawer set. Morgan and her dad enjoyed repainting these pieces of furniture to give them a new unique style. A little Father/Daughter DIY time, a fresh coat of paint and new hardware updated these family pieces to reflect Morgan's flair. We repurposed the bedroom adjacent to Morgan's bedroom to become a dream walk in wardrobe. A previously unused room became a brand new walk in closet, complete with Morgan's very own "beauty bar." An adjustable bar stool was donated for Morgan to practice her hair and beauty techniques on her friends a family. Two clothes racks provided ample room for Morgan to see her stylish wardrobe, and collection of scarves and head bands. By storing the clothing and other items in her new wardrobe, Morgans room was left simple, and clean. The space is now free of any clutter leaving room to rest, rejuvenate and get creative with her artwork! A huge heart felt thank you to Kimbo's wish for including us in this special project. And our thanks to everyone who came out to volunteer on the day of, we couldn't have done it without you! Thank you to all of those who donated their funds, time and resources to accomplish this one day room redecoration project! In the spirit of the Fall Season Jennifer and Lexi were invited to decorate a table centerpiece for an intimate dinner at a beautiful historic lodge on Swan Lake, near Bigfork, Montana. We used a rustic wood box built by our favorite local craftsman, Chris Pemberton filled with fresh crab apples from the trees in Jennifer's yard. We discovered that wiping the crab apples polished them for extra shine. Who knew it was possible to make a delightful crab apple even more gorgeous? White garden fresh phlox from Jennifer's garden added an extra touch to the beautiful centerpiece display. Antique lanterns, and tins combined with pillar candles in varying heights set off an ambience that matched the time frame of the magestic lodge. What a place for a dinner party! A historic hunting lodge from the early 1900's. We thought that this table runner and napkin set from Sundance had the perfect rustic charm. 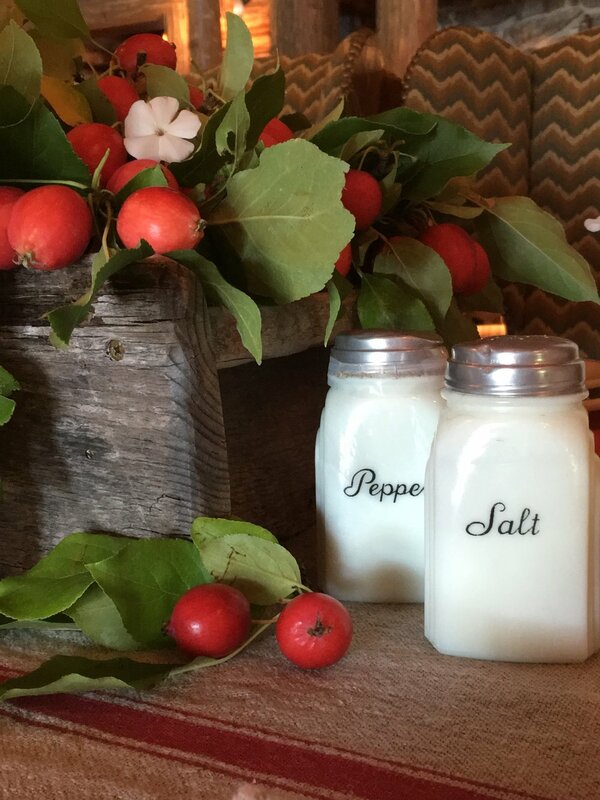 Antique medicine bottles, were used to provide individual floral arrangements at each place setting. Crab apples served as the place name display on the center of the Pendleton dinner plates. Alexandra Lauren Interior Design, Featured on Houzz.com! Whether you have a sprawling back yard, a tiny balcony, or a roof top garden, it's possible to create a stunning outdoor oasis. We are passionate about garden spaces, and outdoor living. A huge thank you to Caroline Chin-Geyler of Arete Culture in Singapore for featuring our Roof Top design project in Hong Kong on Houzz.com today! that helped her update client Ann-Marie Kelley’s Jackson, TN home. What was the overall objective for this home update? How can natural light freshen up your home? Ann-Marie’s living room, her windows had both blinds and draperies. open, they limit the amount of light that comes into a space. To me, they’re pretty much dust-collecting shelves that block your window. More often than not, they are heavy to lift and tend to have mishaps with lever mechanisms. Simply put; I am not a fan! extended well above the window frame and custom draperies that ran 10 inches past each window edge, creating the illusion of wider, taller windows. In my opinion, decorative yet functional draperies are always the way to go: they allow a window to let in all of the natural light during the day but can still be drawn for privacy as needed. in hues from her artwork, amping them up a notch. What is your number one rule for home design? export to North America, Europe and Australia. 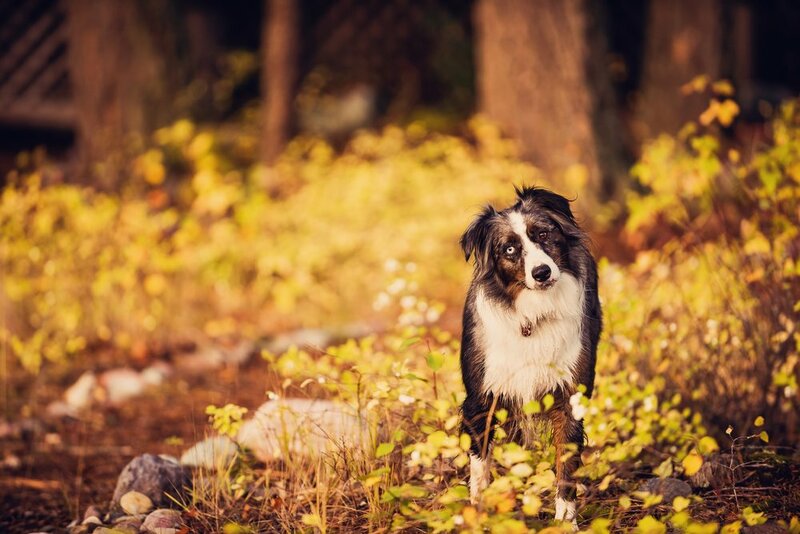 Fall is upon us and its vibrant display of colors are about to ensue. I have had the most fun putting together a beautiful fall palette of muted greens, light french blue, deep burgundy and of course… pumpkin.